To investigate whether primary lateral sclerosis (PLS) represents part of the amyotrophic lateral sclerosis–frontotemporal dementia (ALS–FTD) spectrum of diseases. 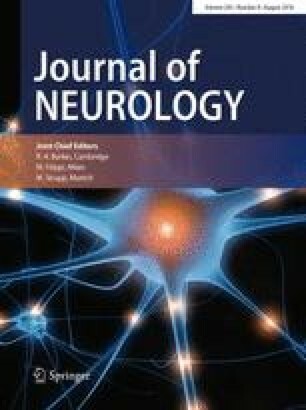 Comprehensive assessment was taken on 21 patients with PLS and results were compared to patients diagnosed with pure motor ALS (n = 27) and ALS–FTD (n = 12). Clinical features, Addenbrooke’s Cognitive Examination (ACE) scores, Motor Neuron Disease Behaviour (Mind-B) scores, motor disability on the ALS functional rating scale (ALSFRS) and survival times were documented. Motor cortex excitability was evaluated using transcranial magnetic stimulation (TMS). Global cognition was impaired in PLS (mean total ACE score 82.5 ± 13.6), similar to ALS–FTD (mean total ACE score 76.3 ± 7.7, p > 0.05) while behavioural impairments were not prominent. TMS revealed that resting motor threshold (RMT) was significantly higher in PLS (75.5 ± 6.2) compared ALS–FTD (50.1 ± 7.2, p < 0.001) and ALS (62.3 ± 12.6, p = 0.046). Average short-interval intracortical inhibition (SICI) was similar in all three patient groups. The mean survival time was longest in PLS (217.4 ± 22.4 months) and shortest in ALS–FTD (38.5 ± 4.5 months, p = 0.002). Bulbar onset disease (β = − 0.45, p = 0.007) and RMT (β = 0.54, p = 0.001) were independent predictors of global cognition while motor scores (β = 0.47, p = 0.036) and SICI (β = 0.58, p = 0.006) were significantly associated with ALSFRS. The cognitive profile in PLS resembles ALS–FTD, without prominent behavioural disturbances. A higher RMT in PLS than ALS and ALS–FTD is consistent with differential cortical motor neuronal abnormalities and more severe involvement of corticospinal axons while SICI, indicative of inhibitory interneuronal dysfunction was comparable with ALS and ALS–FTD. Overall, while these findings support the notion that PLS lies on the ALS–FTD spectrum, the mechanisms underlying slow disease progression are likely to be distinct in PLS. This work was supported by funding to ForeFront, a collaborative research group dedicated to the study of frontotemporal dementia and motor neuron disease, from the National Health and Medical Research Council (NHMRC) (APP1037746) and the Australian Research Council (ARC) Centre of Excellence in Cognition and its Disorders Memory Program (CE11000102). SA was funded by the Ellison-Cliffe travelling fellowship from the Royal Society of Medicine, UK.